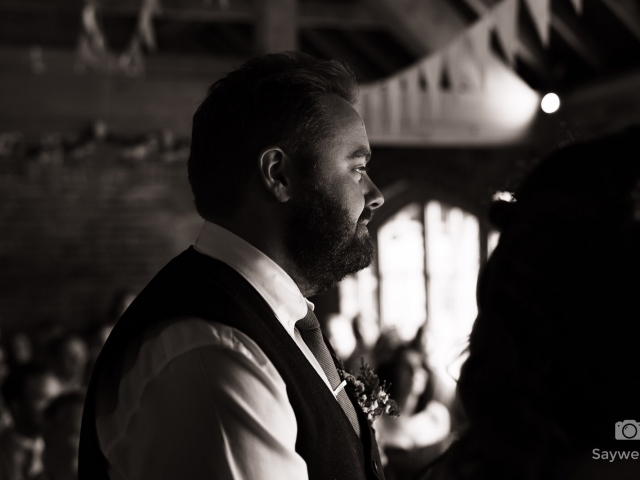 Humanist Wedding Photography at Mapperley Farm, Derbyshire. The day started with me capturing Siobhan, bridesmaids, kids and Siobhan’s family getting ready for the big day. Siobhan was getting ready in a beautiful cottage located about 10 miles from the venue. As with most of my weddings, the morning was nice and relaxed, a few nerves but mostly excited about the wedding. Before the ceremony, Siobhan wanted to make time for her grandma to see her made up in her dress which was a lovely touch. 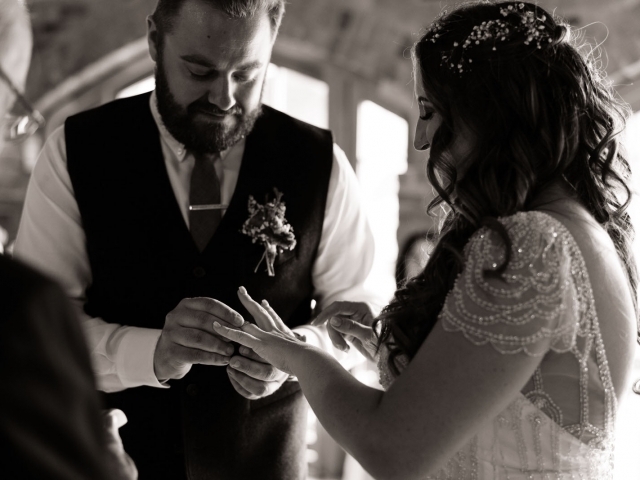 There is a beautiful series of images showing this special moment and although I’m close I’m not that close to stop a special moment from happening. 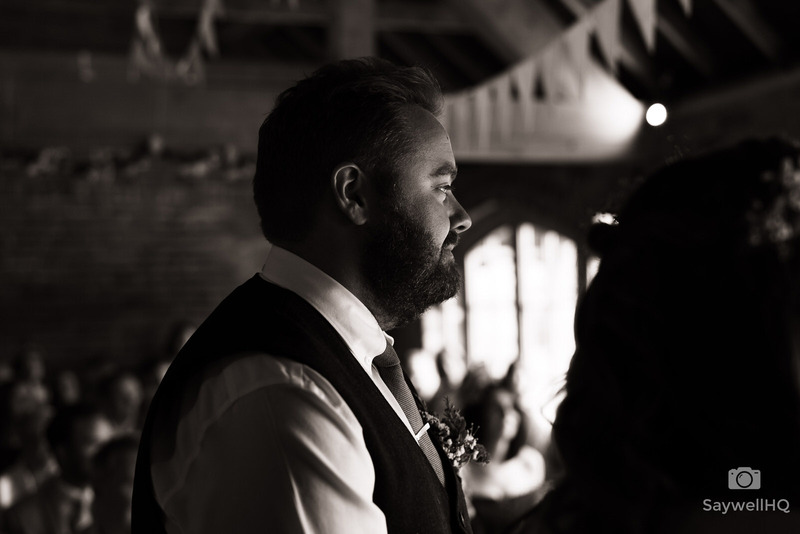 The wedding ceremony was held in the converted barn with its beautiful beams and gorgeous warm feeling. 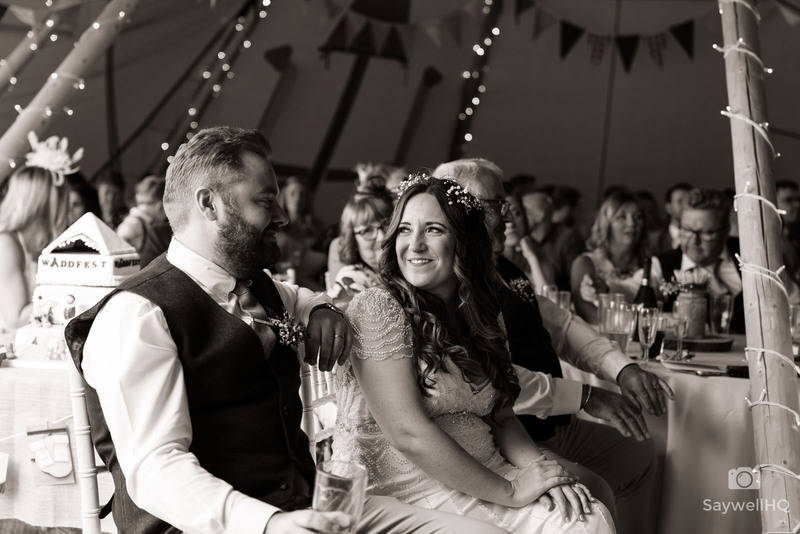 Siobhan and Rob are a very popular couple, you could tell this by the number of people who came to celebrate their day – it felt like most of Derby and Nottingham were there! 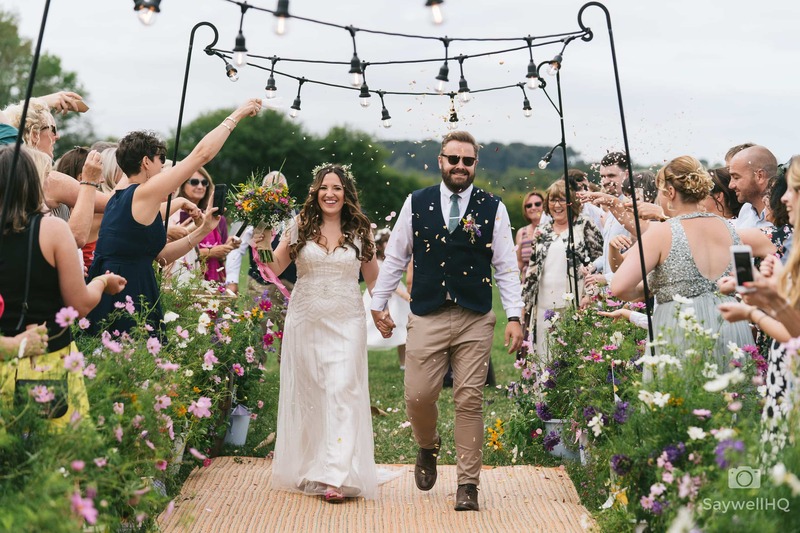 The ceremony was beautifully done, split with a couple of readings and it wasn’t long until we were out in the courtyard toasting the couple and gorging on pork pies and sausage rolls rather than posh canapés. During the time we spent in the courtyard there were lots of hugs, smiles, laughter and joy. 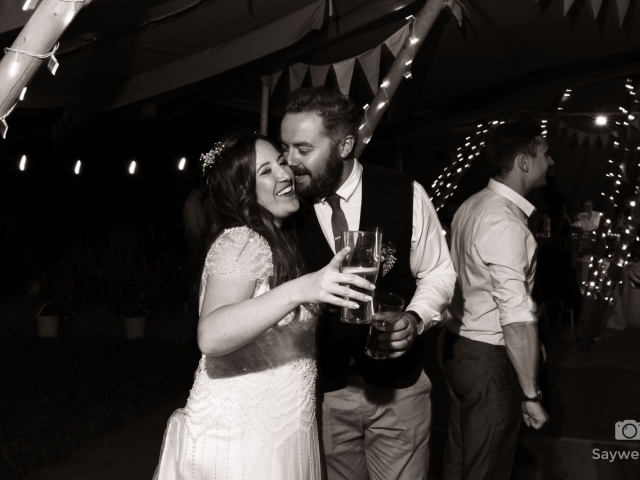 One of the big characters on the day was Siobhan’s dad – Hayden, and there’s one particular image I love (which as I write this sentence is printed out in A2 size and is on my studio wall) – and that’s of Hayden hugging one of the wedding guests – it’s awesome. Something which came as a surprise to Siobhan and Rob was the flash mob singing which had been done completely on the quiet and was another first for me at a wedding. The afternoon was spent in one of the large fields at Mapperley farm which had been kitted out with games for the kids and the grown-ups…. After the food and speeches, which included an appearance from Ronan Keating…. 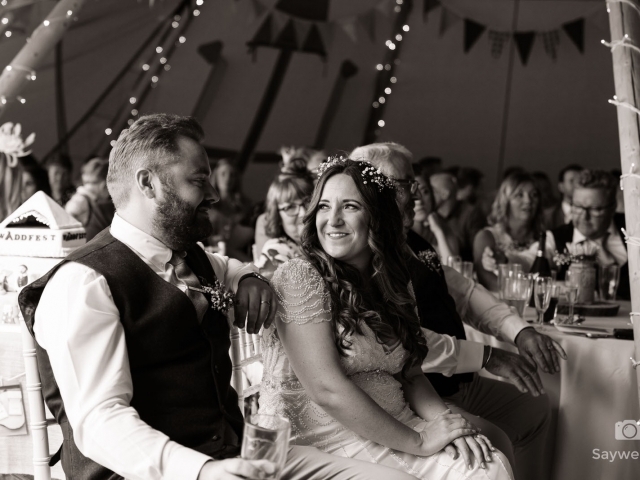 we all headed off to the woodland to watch and listen is Hayden and his mate played some acoustic folk music – yet another example of Siobhan and Rob not wanting a standard wedding but a wedding that was individual to them. 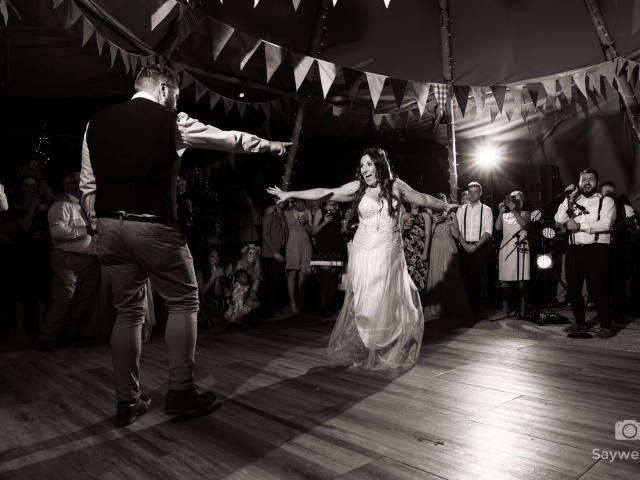 As the sun started to set it was time for the first dance and disco which was held in the big tipi. 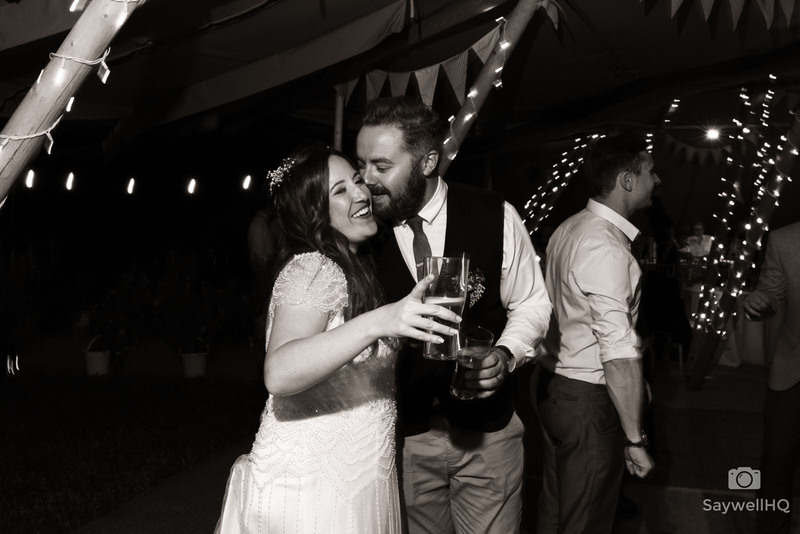 The first dance was a good one, Siobhan and Rob had choreographed a bit of routine – which went down well with all the guests. 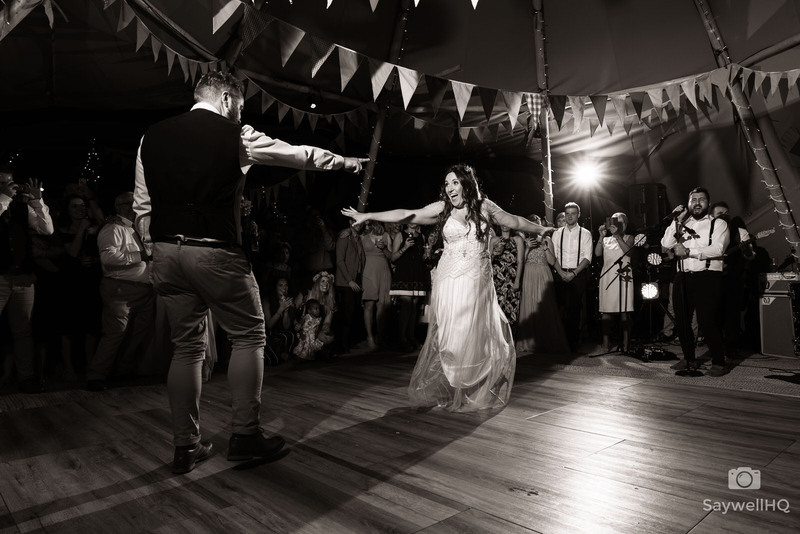 The band that Siobhan and Rob had booked were awesome and their setlist was bang on and the dance floor was never empty, which helped me capture a lot of fun moments – one if which is now my favourite disco/dancing image from a wedding (it’s the last one in the gallery :). 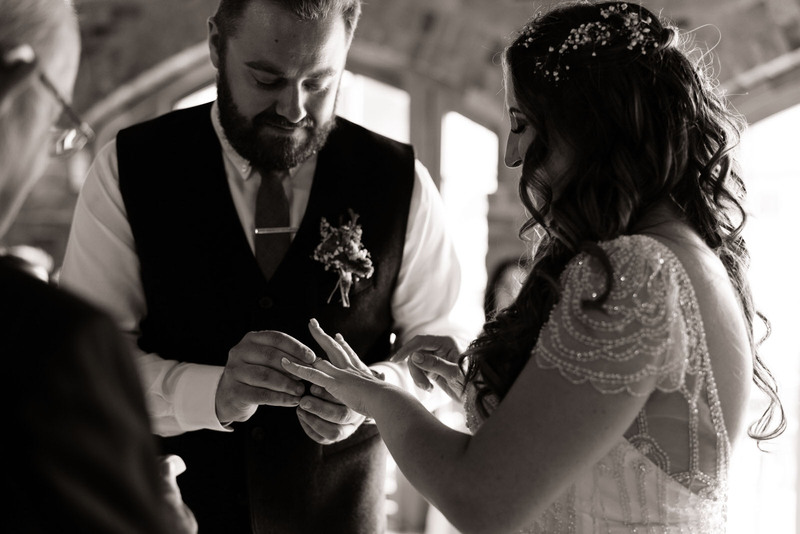 A quick note about the venue; it was lovely, the staff were great and helpful; I’d 100% recommend this for a venue to get married at. Below are a few pictures from the day – all the images were captured using 2x Sony Alpha A9s, Sony Distagon T* FE 35mm F1.4 ZA, Sony FE 85mm F1.8, Sony Planar T* FE 50mm F1.4 ZA and the FE 24-70mm F2.8 GM .